You must register or login to take this course. This is an 8-week course on the Gospel, with several lessons made available each week. NOTE: Not all the lessons are immediately available. Just like any Bible college course, you will have a few lessons each week. You must register to take this course. The normal price for this course is $299. However, those who are part of the Discipleship Group get to take the entire course absolutely free (a $299 value!). Go here to join a discipleship group today. If you are already part of a group log in here. Below are some recommended resources for this course. They are completely optional. Get them if you want to dive deeper into the subject of this course. Am so honored to be part of this course! Am Joseph! I live in Uganda Africa. I wish I could pay those $ and I get even those other courses…. This will help me to grow in spirit and even to help my community! Am a leader in our place, A singles leader. so I will use this chance to teacher others!!!! Thanks so much for starting such a helpful thing. May God bless you so much and to give you more and more wisdom to create more things which can help us to know god more! Thanks for taking the course! I hope these opening lessons help out. Thanks to the almighty God for enabling me get into this site. Hope to be taking this course.Am John living in Kenya, and am a leader in our church. Thanks! I hope you are able to take it as well! So far it great just wish at times you did get off track but it’s great gives me a different way to think on the bible thanks Jeremy am having fun am a truck driver and this helps me to keep focus I just really wish I could put all the pod cast on mp3 player I just don’t know how to do that yet but am enjoying all of it. 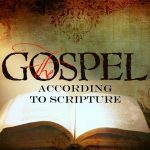 I notice in your intro, you state that the following is a misleading idea of the Gospel: “It’s not enough just to believe. After all, even the demons believe.” This of course is a paraphrase of a passage from the letter of James. It was statements like this that caused Martin Luther to identify the letter of James as an “epistle of straw,” and to reject it as part of the canon of scripture. While this passage is certainly not the Gospel, nonetheless it is part of the Bible, and must be considered as true. Yes! Absolutely. I 100% agree. I am not saying this statement from James 2 is an error. I am just saying it must be understood in context. I think I explain more about this verse later in the course. A future course will include an entire lesson on James 2. I have not decided whether to subscribe — it is a lot of money. I am an old lady who does not sit on her hands and twitter away her life. Not sure I want to commit that much time to it, at this point in my life. From what I have read of your writings, what you say appears to hit the mark in so many ways. I am shocked by the Christian teachings that instruct people specifically “how” to study God’s Word in the “right” way – “how much time to spend” praying and studying the Bible — “how” to come to the “right” interpretation of each Scripture verse/passage (guided by them — tying the hands of God and Jesus’ Holy Spirit, and ignoring that God’s Word is living and active . . . ) — insistence that increased Bible study, prayer and intersession, by their sheer weight, automatically make us closer to being better Christians — closer to perfection and more pleasing to our Lord and Savior. I seek God’s direction through His Word, and through what His Holy Spirit brings to my mind (Scriptures I am reading and have memorized, and guidance He gives to apply His Word and principles in His Word). But consistently a lot of Bible teaching today insists that more and more hours a day in Bible study and prayer, are the goal – leading to perfection and favor in our Precious Lord’s eyes — that the measurable hours equal becoming like Jesus. They teach we are a failure if we don’t fit their formula. I know I will always fall short of perfection (all are sinners and fall short…) — but I am perfectly loved the same every day by God and Jesus. I want to live my life to please Them, sharing Their love and grace and forgiveness with people in my life – and sharing Their Word. But, where do you put “work out your salvation with fear and trembling?” I take those words as a real reminder to me that God’s gift of salvation is not to be taken for granted. There is a fine line between compulsion, and a serious reminder not to ignore what Jesus puts in my heart. Like so many things in God’s Word that appear at first to be contradictory — they are just a tension — finding the point at which they meet may be where God wants us to live. I will not ignore the warning to “work out your salvation with fear and trembling.” Eternity with God and Jesus in heaven, vs. eternity in hell– are not to be taken lightly (gross understatement). Because of that I take seriously Their encouragement to love others in the way They love me — and to encourage others in their faith, or pray that our Lord will rescue them and draw them closer to Him through His Holy Spirit. I know the $299 price is hefty. But please, if you want to take the course, do not pay that much! People who join the “Hope” membership level can take the course for only $9 per month. The “Love” membership level saves even more with an annual payment. I hope to add more courses in the future which members can also take for free. Bible study and prayer do indeed have their place, but I agree with you that as followers of Jesus there is more to life, such as doing what Jesus tells us to do, namely loving our neighbors. I remember the fellow we once knew who attended five Bible studies each week. However, he didn’t even know any of his neighbors. We work with the poor and homeless, and think it remarkable how difficult it has been all the years we have done this to find religious people, especially Christians, who have any interest or time for anything to do with the poor or homeless. But many of them attend multiple church services, Bible studies and so on. We know Christians who have time for the poor and homeless, but it is far from the norm. There seems to be a huge gap between studying the Bible and (assuming we really believe what it says, and especially what it records Jesus telling us to do) actually understanding it and doing what it says. Your comment reveals a lot of spiritual maturity and understanding. We agree that God’s Word is “living and active.” To which I might add, “as opposed to rigid and only to be understood in one way now and forever” (which usually means in the one and only forever and eternal way that someone else is telling me it must be understood). Course 7 if I heard correctly said stop if you got it ,lol I’m at work listening here and there when time provides I’ll listen again completely again tonight ,but Jeremy is this what you were saying .? Well, I was sort of saying that. If you understand that eternal life is by faith alone in Jesus Christ alone, plus nothing (not even this course! ), then you don’t even need to take this course … unless you want to. But some of what I am saying in the course might be a good refresher, or provide a different perspective. Thanks for the teaching .